If you've been sewing bias tape for years then perhaps it's time for you to invest in a snap on adjustable bias tape binding foot. The foot is designed to guide double fold bias tape so you can sew it straight and enclose a layer of fabric, such as for edging. 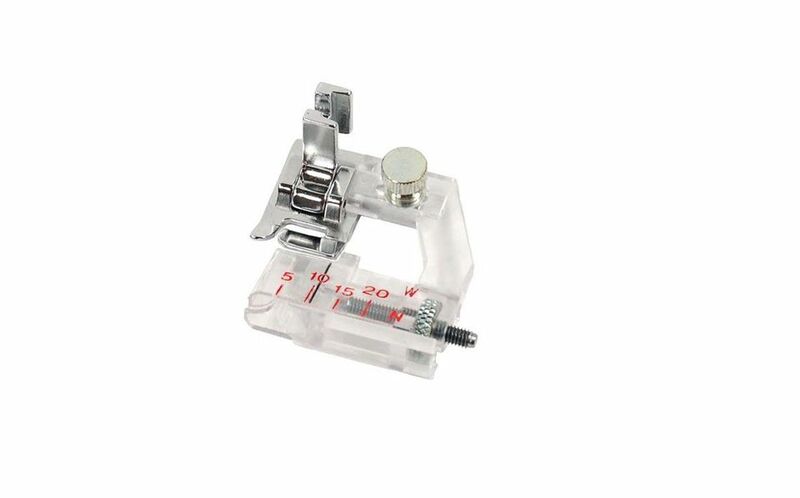 Since this snaps on you will need the foot for your sewing machine if you choose to invest in this type of presser foot. The foot has two adjustment locations. These points are marked with red arrows in the photo. One is on the back, metal side of the foot which tightens and loosens by moving the screw clockwise and counterclockwise. Once this screw is loose, the plastic part of the foot slides left and right and right to left. This screw can be carefully removed to work with just the plastic part of the foot. Be very careful not to lose the small washer if and when you separate the parts of the foot. Once it is in the position you want, you must tighten the screw to keep the foot in place. The other adjustment is a knurled knob on the left-hand side of the plastic part of the foot. This screws in and out, adjusting the "backstop" for the folded edge of the double fold bias tape. Moving both adjustments as far out to the right is for use with wide double fold bias tape and adjustments to the left work best with narrow double fold bias tape. Once the backstop is adjusted, the edges of the bias tape that you will be sewing should be in the upper and lower "lip" edges of the plastic part of the foot. The top of the plastic part of the foot does separate which seemed like it would allow for fabric or the bias tape to be held. However, the tape did not feed smoothly through the foot at first. To do this you must adjust the "backstop" via the bottom screw adjustment which allows the tape to feed through and helps guide the tape so it stays where it belongs in the "lips" of the foot. The top part of the plastic, which also has numbers on it, is purely for a guide to set the "backstop". It's easiest to set the plastic part of the foot and start the tape through the foot by un-attaching the plastic part from the metal part of the foot. You may also want to adjust your needle position in order to stitch closely to the edge of the bias tape. 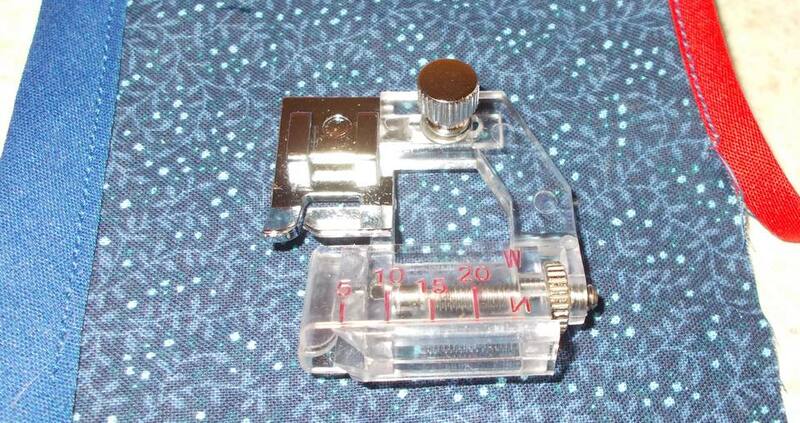 As with any sewing, watching a guide and not the needle is imperative to sewing straight. While sewing with this foot, you need to watch the location of the edge of the bias tape that would be sewn and occasionally use a straight pin to guide the edge of the tape back in to the lip of the foot, especially when you sew with the narrow bias tape because the backstop does not adjust far enough to hold it in place. Looking carefully at the photo, you can see that the "backstop" (yellow arrow) behind the fold of the bias tape is adjusted for the width of the folded bias tape but that the back stop did not move all the way over to the fold for the red, narrow bias tape. To test the foot for binding quilted fabric we used a sample of quilted fabric, using one layer of lightweight cotton batting between two pieces of cotton fabric. The sample was two thick for the foot. The quilted sample and the bias tape did not fit in the foot. We do not recommend to buy this foot to bind quilted materials or to bind quilted or layers of fabric as the opening in the foot is not large enough to handle even thin layers of fabric. Overall, the price of the foot made it a good investment but it's unclear if it would be helpful for small tasks. Perhaps if you were binding something like a BBQ apron it would be worthwhile but know that basic methods to sew on double fold bias tape are tried and true.